Frank Anthony Polito, May 2009. This sequel to 2008’s Band Fags! explores the same universe but with a different focus. Jack Paterno, hero of the first book, has a falling-out with his Best Friend Brad Dayton at the beginning of their senior year. We followed Jack through that year in the first book, but I don’t think I was alone in wondering what Brad was up to all that time. Turns out he was doing a lot of the same things as Jack – crushing on boys, working at a crap job, loving pop music and movies, and exploring gay bars in suburban Detroit. The books read very similarly, so if you loved Band Fags!, you’re in for a treat. If, on the other hand, you thought it was hilarious but too long and dragged a little in places, you might feel the same way about this one. However, Drama Queers! is actually the better book. I think that’s because it’s less autobiographical, so the author felt able to take more artistic liberty rather than presenting his teen years basically unfiltered. Or maybe it’s that this book is more structured, taking place over just one school year and following Brad from the first day of fall through senior prom. Or it could just be that I was a theater geek myself and never played in the band. In any case, enjoy this romp through 1980s Detroit. 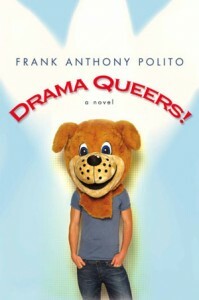 This entry was posted in 2009, Frank Anthony Polito, gay male, high school, historical, lesbian, problem novel, prom, queer protagonist, realistic, sequel. Bookmark the permalink. One Response to Drama Queers!